For more information concerning grant qualifications click here. You will not be able to save or edit your application, and will need to complete this application in one sitting. A document is provided here with application questions in advance. "Please click the following link for the information session PowerPoint." Can the faith based entity partner with another group for their project : The answer is yes. The faith based organization must be the lead organization for the project. How do the faith based organization receive the grant funds? This is a reimbursable grant. All documentation for reimbursement must line-up with grant requirements. Will the Urban League be open to providing technical assistance with the project portion of the grant? 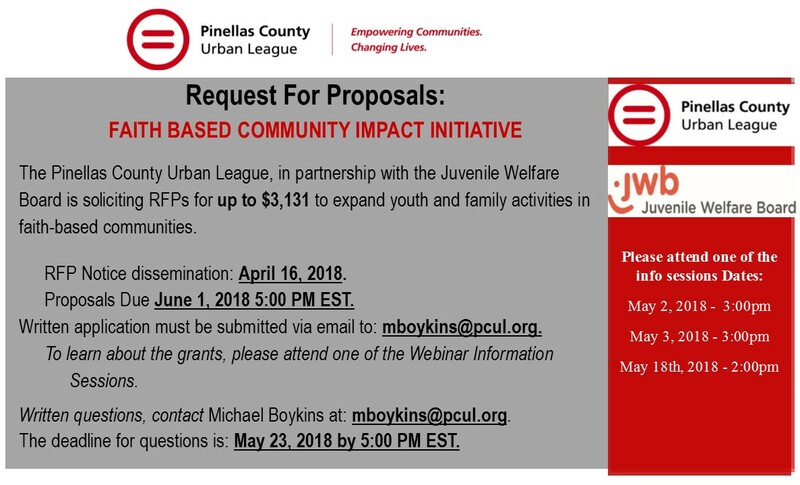 Yes, the Urban League is here to assist in the success of the projects selected and the overall impact of the service provided to the community.